After completing his doctoral studies in organic chemistry at the University of Wyoming, Brian Keen spent the next four years as a professor of organic chemistry at the University of Wisconsin and Penn State University. Dr. Keen says his time in academia was a rewarding experience. However, his interest in actively developing and improving chemical processes led him away from the classroom and into industry. In 1980, Dr. Keen joined Union Carbide at its South Charleston, West Virginia, research and development park. 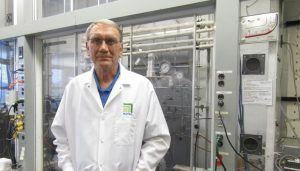 Dr. Brian Keen, founder of Keen Process Technologies in South Charleston, has patented a method of manufacturing propylene from natural gas liquids. His process could play a significant role in in growing West Virginia’s chemical industry. Over the next 28 years, culminating as a senior technology manager and scientist for Union Carbide and its successor Dow Chemical, Dr. Keen was directly involved with developing and improving chemical processes for dozens of materials that go into consumer products from automotive brake fluids to high-definition televisions. He holds more than 35 patents, most related to chemical products and processes. When he retired from Dow Chemical in 2008, Dr. Keen formed Keen Process Technologies with two goals in mind: 1) to continue his work in developing and improving chemical processes and 2) to focus on projects that can directly benefit West Virginia. Clearly, the nation’s shift away from coal has had a jarring effect on much of the state. However, that shift away from coal and, to some extent, oil has opened a window of opportunity for West Virginia and its abundant natural gas reserves. Investment by the U.S. EDA and the State of West Virginia in the ScaleUp West Virginia program made it possible for Keen Process Technologies to achieve measurable progress on three projects that could make the state’s natural gas more accessible and valuable to a wider market. Specifically, those investments allowed the Chemical Alliance Zone to provide critical business and technical assistance that have positioned the company to continue its growth. The Chemical Alliance Zone provided assistance for proof-of-concept studies, patent preparation, investor pitch preparation, partner facilitation, and more. One of the company’s projects is focused on improving how propylene, a key precursor to many plastics, is produced. This innovation was recently granted a U.S. patent. Most of the nation’s propylene has been produced as a byproduct through a process in which naphtha, a component of oil, is “cracked” into ethylene at large “cracker” facilities. Those facilities increasingly are shifting away from an oil-based feedstock in favor of ethane, which is derived from natural gas, now highly abundant in the United States thanks to Marcellus shale and other shale formations. While that shift has created an advantage for making ethylene in the United States, the process does not generate large amounts of propylene as a byproduct, causing a supply issue for propylene in the United States. With the help of the ScaleUp West Virginia project and the Chemical Alliance Zone, Dr. Keen also has made measurable progress in demonstrating proof of concept technologies for safe, efficient production of both high-octane fuel and oxygen containing hydrocarbon liquids from natural gas streams. These technologies could potentially be carried out at smaller facilities scattered across the nation, including in West Virginia. At the very least, Dr. Keen’s innovations offer potential for alternative markets for stranded natural gas and natural gas liquids. There is still work to be done on all three of Keen Process Technologies’ process-development projects, but the feedback Dr. Keen is receiving from the industry indicates he is on the right track on all three. And, the EDA and the State of West Virginia’s support through ScaleUp West Virginia have been instrumental in moving each forward. “I would not have been able to prove the feasibility of these process improvements without this program,” he said. TechConnect West Virginia, Chemical Alliance Zone, and stakeholders across the state look forward to seeing Keen Process Technologies continuing to build on this progress. **Note: TechConnect’s partners on the ScaleUp West Virginia program include the Robert C. Byrd Institute, the Center for Applied Research & Technology, the Chemical Alliance Zone, INNOVA and the WV Manufacturing Extension Partnership.